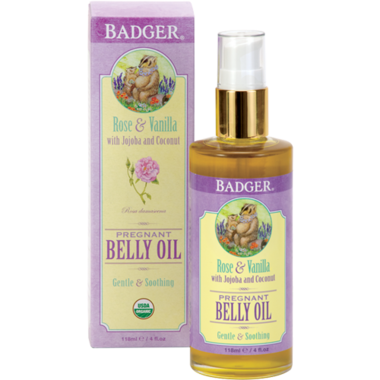 Pamper your evolving body with the wonderfully luxurious Badger's Mom Care Pregnant Belly Oil. Lightly fragranced with the natural aroma of rose and vanilla, this gentle blend of pure organic plant extracts and emollient-rich essential oils helps to relieve your dry, tight, and stretched pregnant belly skin. Jojoba and coconut moisturize and nourish. Sunflower and calendula soften and soothe. Perfect for daily use or an indulgent massage—ideal after a bath or shower to help lock in moisture and maintain skin’s elasticity and softness. Absorbs quickly and is non-greasy. Hypoallergenic and suitable for all skin types. Badger’s new Mom Care line is certiﬁed organic and 100% natural. This trio of safe, nourishing and luxuriant products—Pregnant Belly Oil, Belly Butter, and Nursing Balm—are specially formulated to soothe, comfort and protect dry, tight, stretched skin on belly and body, during and after pregnancy. Gentle blends of soothing organic plant extracts and emollientrich essential oils help moms and moms-to-be feel their best during this special time. Certiﬁed Organic, 100% natural, and lab tested hypoallergenic. Safe, nourishing and specially formulated to care for sensitive and changing skin, during and after pregnancy. Soothing, emollient-rich blends relieve dry, tight, stretched skin. Jojoba and Coconut moisturize and nourish. Sunﬂower, Calendula and vitamin E soften and soothe. Free of artiﬁcial ingredients, fragrances, dyes, parabens, petrolatum, GMOs, synthetics, lanolin, or harsh ingredients. Directions: For best results apply daily, during and after pregnancy. Use to moisturize dry, tight, stretched pregnant belly skin. Ideal after a bath or shower to help lock in moisture and maintain skin’s elasticity and softness. I like the texture, the oil absorbs pretty well, but the scent is just off. I love that everything is organic and clean, but I think it's the sunflower oil mixed with the rose and vanilla just turns my pregnancy nose. It's just too much. Will not purchase again sadly. This is the best! I found it much more effective than creams (I've tried several creams and none compare to this). So easy to apply, oil soaks in fast, keeps skin moisturized without feeling greasy, and the smell is lovely. Last a long time and 100% organic so well worth the price. Two bottles should get you through your entire pregnancy start to finish using 2x/day and you'll still have some for after birth. Bought this as a gift for a friend. i have used Badger face cleansing oil and Badger hair oils in the past. Badger makes phenomenal products. This is a pretty big bottle. Excellent quality, well worth the price.